Last week I went on my first work shadowing visit as part of the Penumbra programme run by Cambridge University. This first visit was to Selwyn College Library and I was very lucky to have the wonderful Sarah Stamford and her team show me round. My day started with a quick tour of the college. I’m slightly embarrassed to admit that I’ve lived in Cambridge all my life and barely know which college is which, never mind visited many of them. This was my first time inside Selwyn and it’s a lovely looking place. Our first stop was a trip to the archives and a quick chat with the archivist Elizabeth Stratton, who was putting the finishing touches to an exhibition of college history. I was surprised to see artifacts alongside the traditional documents and photographs but Elizabeth explained to me that items like this helped to set the more traditional items in context and it made sense to house them both together. We also discussed how Selwyn are encouraging today’s students to contribute to the archives of the future, a very important point that often gets forgotten. Even recent students are asking to see photographs and documents from their time at the university, but this is largely dependent on the donations that the archives receive. Next I was given a tour of the library. Despite being somewhat smaller than the library I’m used to, it was a very warm and welcoming space. I especially liked the silent study room where not even computers are allowed. I was impressed that this was an idea which came from the students themselves. I think that the idea of the library as a space to study in peace is often overlooked. I know that I've been in to the library on my days off just because I know that I can get some peace to get some work done. There is a lot of emphasis right now on how libraries need to adapt to accommodate changing study patterns such as group work and whilst this is important, I think that the need for a quiet place shouldn’t be overlooked. There are precious few places that people can go to get true peace anymore and I’m pleased that the students (and the library) recognise this. The remit of the library is to support undergraduate teaching and it relies on reading lists and recommendations when selecting stock. Since I work in a legal deposit library, it was nice to see how books are selected rather than the way they just seem to magically appear at the UL! With a stock of c.40,000 items the point was made that the staff could look and see what is being used. Purchasing decisions could then be made based on this. This would be somewhat difficult in a massive library like the UL but it was very educational to see how things happen in a more traditional college library. Another part of the remit of the library is to foster a good relationship with students. By working with the students to provide them with what they want and need the library is setting a good grounding for students future relationship with the college. We also talked a little bit about the library’s social media presence. This was of particular interest to me since my dissertation research is in this area. The library’s Facebook page is targeted at students rather than other librarians and aims to be an informal way of sharing news and events. The staff tries to keep the page people focused and light-hearted. Official communication is still done via email meaning that the Facebook page is a supplement to communication rather than a replacement. Based on my research this is the best way to go since not all users respond to social media. It is a good way of enhancing relations but it shouldn’t be relied on. 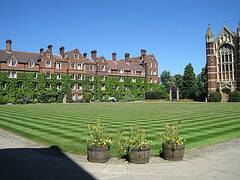 I really enjoyed my visit to Selwyn and would like to extend a massive thank you to the team there. I only wish the library (and librarians) had been this wonderful when I was at university!